A cerebral aneurysm (also called an intracranial aneurysm or brain aneurysm) is a bulging, weakened area in the wall of an artery in the brain, resulting in an abnormal widening or ballooning. Because there is a weakened spot in the artery wall, there is a risk for rupture (bursting) of the aneurysm. A cerebral aneurysm generally occurs in an artery located in the front part of the brain which supplies oxygen-rich blood to the brain tissue. A normal artery wall is made up of three layers. The aneurysm wall is thin and weak because of an abnormal loss or absence of the muscular layer of the artery wall, leaving only two layers. The most common type of cerebral aneurysm is called a saccular, or berry aneurysm, occurring in 90 percent of cerebral aneurysms. This type of aneurysm looks like a “berry” with a narrow stem. More than one aneurysm may be present at the same time. Two other types of cerebral aneurysms are fusiform and dissecting aneurysms. A fusiform aneurysm bulges out on all sides (circumferentially). Fusiform aneurysms are generally associated with atherosclerosis. A dissecting aneurysm may result from a tear in the inner layer of the artery wall, causing blood to leak into the layers. This may cause a ballooning out on one side of the artery wall or it may block off or obstruct blood flow through the artery. Dissecting aneurysms may occur with traumatic injury. The shape and location of the aneurysm may affect what treatment is performed. Most cerebral aneurysms (90 percent) are present without any symptoms and are small in size (less than 10 millimeters, or less than one half of an inch, in diameter). Smaller aneurysms may have a lower risk of rupture. Although a cerebral aneurysm may be present without symptoms, the most common initial symptom of a cerebral saccular aneurysm is a subarachnoid hemorrhage (SAH). SAH is bleeding into the subarachnoid space (the space between the brain and the membranes that cover the brain). A ruptured cerebral saccular aneurysm is the most common cause (80 percent) of SAH. SAH is a medical emergency and may be the cause of a hemorrhagic (bleeding) stroke. Hemorrhagic strokes occur when a blood vessel that supplies the brain ruptures and bleeds. When an artery bleeds into the brain, the brain cells and tissues do not receive oxygen and nutrients. In addition, pressure builds up in surrounding tissues, and irritation and swelling occurs. About 20 percent of strokes are caused by hemorrhagic bleeding. Increased risk of rupture is associated with aneurysms that are greater than 10 millimeters (less than one half of an inch) in diameter, a particular location (circulation in the back portion of the brain), and/or previous rupture of another aneurysm. A significant risk of death is associated with the rupture of a cerebral aneurysm. Currently, the cause of cerebral aneurysms is not clearly understood. 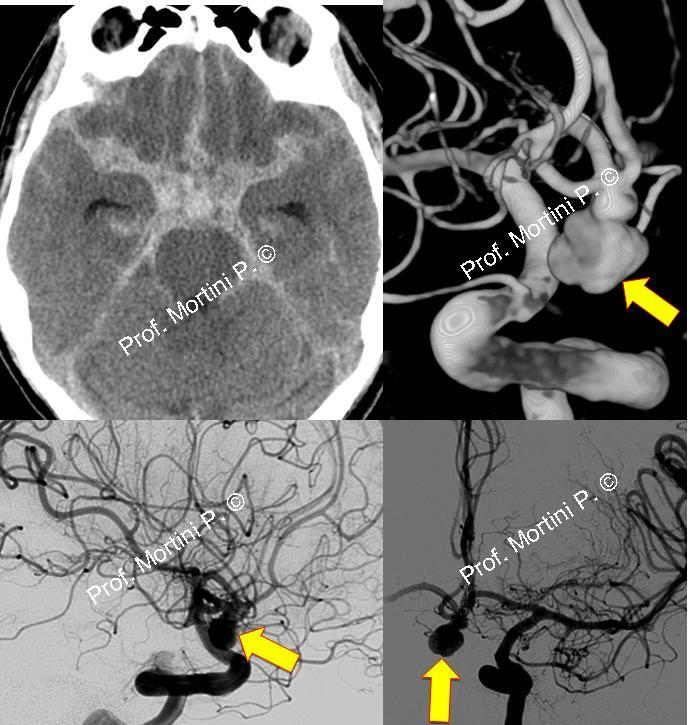 The formation of cerebral saccular aneurysms has been associated with predominantly two factors: an abnormal degenerative (breaking down) change in the wall of an artery and the effects of pressure from the pulsations of blood being pumped forward through the arteries in the brain. Certain locations of an aneurysm may create greater pressure on the aneurysm such as at a bifurcation (where the artery divides). The forming of a cerebral aneurysm has also been linked to risk factors that are inherited or may develop later in life (acquired risk factors). • alpha-glucosidase deficiency – a complete or partial deficiency of the lysosomal enzyme, alpha-glucosidase. This enzyme is necessary to break down glycogen and to convert it into glucose. • polycystic kidney disease (PCKD) – a genetic disorder characterized by the growth of numerous cysts filled with fluid in the kidneys. PCKD is the most common medical disease associated with saccular aneurysms. A risk factor is anything that may increase a person’s chance of developing a disease. It may be an activity, such as smoking, diet, family history, or many other things. Different diseases have different risk factors. Although these risk factors increase a person’s risk, they do not necessarily cause the disease. Some people with one or more risk factors never develop the disease, while others develop disease and have no known risk factors. Knowing your risk factors to any disease can help to guide you into the appropriate actions, including changing behaviors and being clinically monitored for the disease. The presence of a cerebral aneurysm may not be known until the time of rupture. However, occasionally there may be symptoms that occur prior to an actual rupture due to a small amount of blood that may leak, called “warning leaks,” into the brain. The symptoms of a cerebral aneurysm may resemble other problems or medical conditions. Always consult your physician for a diagnosis. How is a cerebral aneurysm diagnosed? A cerebral aneurysm is often discovered after it has ruptured or by chance during diagnostic examinations such as computed tomography (CT scan), magnetic resonance imaging (MRI), or angiography that are being done for other conditions. digital subtraction angiography (DSA) – provides an image of the blood vessels in the brain to detect a problem with blood flow. The procedure involves inserting a catheter (a small, thin tube) into an artery in the leg and passing it up to blood vessels in the brain. A contrast dye is injected through the catheter and x-ray images are taken of the blood vessels. computed tomography scan (CT or CAT scan) – a diagnostic imaging procedure that uses a combination of x-rays and computer technology to produce cross-sectional images (often called slices), both horizontally and vertically, of the body. A CT scan shows detailed images of any part of the body, including the bones, muscles, fat, and organs. CT scans are more detailed than general x-rays, and may be used to detect abnormalities and help identify the location or type of stroke. magnetic resonance imaging (MRI) – a diagnostic procedure that uses a combination of large magnets, radiofrequencies, and a computer to produce detailed images of organs and structures within the body. An MRI uses magnetic fields to detect small changes in brain tissue that help to locate and diagnose a stroke. magnetic resonance angiography (MRA) – a noninvasive diagnostic procedure that uses a combination of magnetic resonance technology (MRI) and intravenous (IV) contrast dye to visualize blood vessels. Contrast dye causes blood vessels to appear opaque on the MRI image, allowing the physician to visualize the blood vessels being evaluated. What is the treatment for cerebral aneurysm? Depending on your situation, the physician will make recommendations for the intervention that is appropriate. Whichever intervention is chosen, the main concern is to decrease the risk of a subarachnoid hemorrhage, either initially or from a repeated episode of bleeding. Many factors are considered when making treatment decisions for a cerebral aneurysm. The size and location of the aneurysm, the presence or absence of symptoms, the patient’s age and medical condition, and the presence or absence of other risk factors for aneurysm rupture are considered. In some cases, the aneurysm may not be treated but the patient will be closely followed by a physician. In other cases, surgical treatment may be indicated. This procedure involves the surgical removal of part of the skull. The physician exposes the aneurysm and places a metal clip across the neck of the aneurysm to prevent blood flow into the aneurysm sac. Once the clipping is completed, the skull is sutured back together. Endovascular coiling is a minimally invasive technique, which means an incision in the skull is not required to treat the cerebral aneurysm. Rather, a catheter is advanced from a blood vessel in the groin up into the blood vessels in the brain. Fluoroscopy (a special type of x-ray, similar to an x-ray “movie”) will be used to assist in advancing the catheter to the head and into the aneurysm. Once the catheter is in place, very tiny platinum coils are advanced through the catheter into the aneurysm. These tiny, soft, platinum coils, which are visible on x-ray, conform to the shape of the aneurysm. The coiled aneurysm becomes clotted off (embolization), preventing rupture. This procedure is performed either under general or local anesthesia.